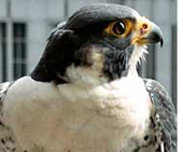 most birds of prey--falcons, eagles, hawks--have similar features tapered wings, dilated pupils and a sharp beak. But, as believed earlier, they are not related to one another. Falcons, in fact, are closely related to parrots and songbirds. So much for physical features, says a study that changes our understanding of the relationship between groups of birds. Morphological characters are often misleading when it comes to understanding the evolutionary tree of life of birds says the study that analyzed dna samples of 169 species of birds. This study is a part of the tree of life project by researchers from the world over. The project studies evolutionary relationships among several organisms, including fungi, insects and flowering plants. The results of the dna-based study have busted so many holes on the evolutionary tree of birds known so far that some scientific names will now have to be changed, say researchers. "We learned two major things. First, birds that look or act similar are not necessarily related. Second, much of the conventional wisdom on the evolutionary relationships of birds is wrong," says Sushma Reddy, the lead author. For example, the colourful hummingbirds, active during the day, evolved from the nocturnal nightjars with a short beak, a marked contrast from the hummingbird's long and slender beak. The relationship between various bird groups has always been contentious. Questions such as whether water birds gave rise to land birds through the intermediate group of shore birds are still hotly debated. The study says that shore birds are not the basal group from which modern birds arose. Evolutionary relationships between bird groups are not understood well since there are not many intermediate forms that connect distinct bird groups. This is because modern birds evolved rapidly, in just a few million years--a short time for evolution, says the study published in Science (June 27). For the study, researchers measured the differences in the dna of the species studied to conclude how long ago the species diverged. Distant cousins have more differences in their dna than close relatives. The study, called the early bird project, showed that the closest relatives of the perching birds (order passiformes which comprises 60 per cent of all modern birds such as crows) are the psittaciformes, the order that has parrots in it. And the next closest relative to these orders are the falcons. The study, involving various laboratories in the us, such as the Field Museum, Chicago, and the University of California, Berkeley, also indicates that birds adapted to different environments and evolved different lifestyles multiple times. For example, falcons developed the characteristics of a raptor independently; eagles and hawks developed these traits under different circumstances. These results add to the existing database of the tree of life project. About 300 biologists from 21 countries contribute to the database but some say that the project has not brought about any major changes, for example, in the taxonomy of terrestrial vertebrates.